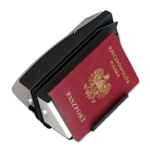 The VPR 610e optical-RFID reader is a specialized device designed to read OCR and RFID information contained in Machine Readable Passports, Visas, ID-cards and other travel documents. It captures machine readable codelines in single hand "swipe" operation and transmits recognized data to a host computer. In the next step all data from RFID tag embedded in e-Passport can be retrieved. External computer collects data and optionally verifies its conformance to the user-defined data base, or sends information outside.